Installation of irrigation in function of the water needs of each plant or tree in order to minimize the consumption of water. We calculate the best system for each case: drippers, sprayers, sprinklers, recovery of rainwater or groundwater recovery systems. Study of the feasibility of lawn and advice for the best turf variety depending on your location and consumption needs. Laying of turf or sowing seeds. 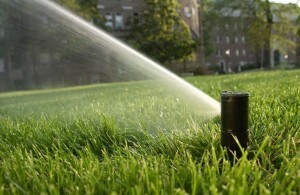 Water savings, the difficulty in the installation of irrigation systems, the continuing occupation of the spaces, the lack of time or light can make it difficult or impossible for the establishment of lawn. That is why we have a wide range of textures and colours of artificial turf that will allow you to enjoy a green space. In addition we offer a wide range of different possibilities for pavements (gravel, stones, pebbles, bark, etc. ), fence (wood, metal, plastic, etc.) or garden furniture depending on your needs and taste.